Instant switching between classical tunings, baroque pitch, etc. 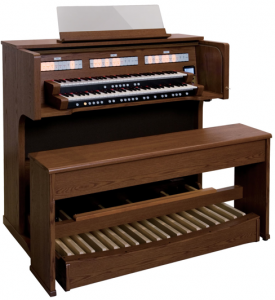 RSS (Roland Sound Space) offers the rich, ambient sound of a real pipe organ, and the keyboards feature authentic tracker touch. Each speaking stop of the C-380 controls three alternative voices (Voice Palettes) covering a wide range of taste and styles, from the Baroque era, through to the large romantic organs of the 19th and 20th Centuries. The C-380 contains USER Coupler functions which combine your choice from a palette of organ and orchestral sounds with the C-380’s own stops. This allows you to create hundreds of different sound combinations and then store them on the organ’s memory pistons. More information is available on the C-380 product page.